Teaforthree provided trainer Rebecca Curtis with her first Festival success when justifying 5/1 favouritism to win the opening Diamond Jubilee National Hunt Chase. “We always fancied him but you have to have a lot of luck around here,” said Curtis, who has a 30-strong team at her stable in Wales. “All he does is stay and he jumps well, which is what you need. “It wasn’t the plan to make the running with him but he was there. He probably is better on more testing ground but you can get away with it a bit over four miles. “A P (McCoy) had ridden him for his chase wins and always liked the horse. He wanted the best for the horse so helped to get J T (McNamara) to ride him. “Ever since he won his first chase I’ve said he was a National type of horse. He could go for the Irish National this season and hopefully he will be an Aintree horse next year. “It’s a massive boost for the yard to have a winner here, people notice it. Owner Nigel Roddis took the gamble of selling shares in Teaforthree to some of his friends, but the decision paid off when the horse won today’s Diamond Jubilee National Hunt Chase. Roddis, who is part of the Racing For Change team that is attempting to broaden racing’s promotion of itself, initially organised a deal to lease the horse from former owner Gearoid Costelloe, partner of trainer Rebecca Curtis, but when that arrangement ended he stepped in to become an owner himself. He said: “I leased the horse last year for Soccer AM [Sky Channel’s Saturday morning football programme] which wanted to get some publicity to a new audience and felt a racehorse would be a good outlet. When the lease expired, Soccer AM wanted to move on. “I felt he was a cracking horse, so got some mates together [to buy him] and I’m pleased to say I was proved right. Rider J T McNamara is one of Ireland’s leading amateurs and a regular feature at the Festival. He said: “He jumped and travelled beautifully and came away from the last. “AP McCoy put me onto the horse - he rang me and told me to make sure I got the ride. I got the same message from Andrew McNamara and Enda Bolger. “The first time I sat on him was in the parade ring. Harry The Viking may next be making the long trip from Somerset to Ayr after finishing two lengths behind Teaforthree when second in the Diamond Jubilee National Hunt Chase. The seven-year-old, who is co-owned by Sir Alex Ferguson, is likely to be primed for a run in the Scottish National. Trainer Paul Nicholls said: “I’m very happy. Will gave him a great ride. He was always going well and stayed on strongly. He ran nicely. Biddick was later fined £650 by the stewards for changing his boots after weighing out. 1. The Diamond Jubilee National Hunt Chase has been run more times than any other race at The Festival, and is in its 142nd year in 2012. Until the 1930s, only the Grand National was more important than the National Hunt Chase in the Jump calendar. The race had been run at a number of venues until it became a part of the new two-day National Hunt Festival at Cheltenham in 1911. It had also been run at Cheltenham in 1904 and 1905. 2. The four-mile Diamond Jubilee National Hunt Chase is the longest race run at The Festival. The distance was reduced in distance by a furlong in 2008 and reverted back to the Old Course. 3. The race is usually one of the best supported at The Festival, with very competitive fields each year. The largest post- war field size was 37 (1948) and the smallest 13 (1993). There is now a safety limit of 20 runners. 4. Flimsy Truth, a 33/1 chance, set a record post-war time of 8 mins 11.09s in 1998 but that was beaten by Relaxation in 2000, who scored in 8 mins 0.60s. 5. Flimsy Truth is not the longest-priced post-war winner - that honour goes to Topsham Bay, successful in 1990, and 2005 winner Another Rum, who were both returned at 40/1. Castledermot, 6/4 favourite in 1949, is the shortest-priced victor. 6. The race has proved a good guide to future success in recent seasons. The 2007 winner Butler’s Cabin subsequently won the Irish Grand National, while 2006 victor Hot Weld landed a memorable double in 2007 by collecting the Scottish National and the Sandown Gold Cup in the space of a week. 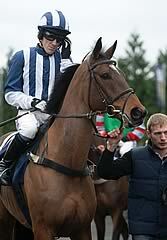 The 2007 John Smith’s Grand National victor Silver Birch finished fourth in 2004. The 2009 winner Tricky Trickster took the Grade Two AON Chase at Newbury the following year. The 2011 runner-up, Beshabar, went on to win the Scottish National at Ayr a month later. 7. The 2008 race was run as the Peter O’Sullevan National Hunt Chase to celebrate the legendary commentator’s 90th birthday and in 2012 honours the Diamond Jubilee of Queen Elizabeth II. 8. Katie Walsh, whose father Ted and brother Ruby had both enjoyed great success at past Cheltenham Festivals, joined an elite group of female riders to have won at Jump racing’s biggest meeting when riding Poker De Sivola to beat her best friend Nina Carberry in the 2010 race on Becauseicouldntsee.